Homes from the Heart cofounder Bob Miller died recently at his home in Kansas City, Missouri. Bob was a giant among generous people. His priorities in order were God, family, work. His legacy lives on through the thousands of people his generosity has benefited. Bob was a strong backer of building homes for those struck by disaster, first in El Salvador following the 2001 earthquake, and more recently in Haiti. 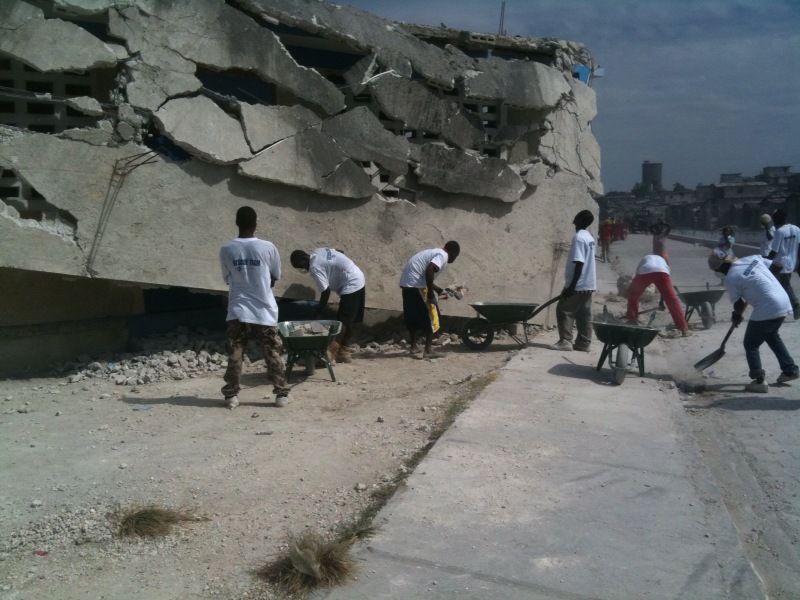 Michael Bonderer and Rob Beckham on the job in Haiti. Work is underway for Homes from the Heart in cooperation with Fuller Center for Housing, with Catholic Relief Services, and working alongside many Haitian disaster victims themselves to build one hundred permanent, safe homes in Balan, Haiti. You can help us achieve this very practical goal with your financial support and by volunteering your time. Bob Miller, of Kansas City, Mo., died on August 1, 2010, at his home surrounded by his family. He was born in Kansas City on May 31, 1929, to Robert and Mary (Tierney) Miller. He lived his entire life in Kansas City and was able to walk to St. Frances Xavier grade school, Rockhurst High School and Rockhurst College. He served his country in the Korean War as a member of the U.S. Army Counter-intelligence Corps. Upon his return from service, Bob began a career in the insurance industry. He married Carol T. Shaughnessy on June 21, 1958 and had four children. He started the Robert E. Miller Insurance Agency in 1961. Bob taught “Country Speech” at Rockhurst College for 30 years and, in the Jesuit tradition, was a true “Man for Others.” He served in many capacities for numerous organizations throughout his life, including Rockhurst High School and College, Avila University, the Greater Kansas City Community Foundation, St. Joseph Hospital, Ozanam, Marillac Center for Children, Lalmba (an African relief organization) and Water Partners International and many others. He was an active member of St. Thomas More Parish for over 40 years.